If there is one thing that is pretty clear, it’s that wires will have no place in the distant future. And considering all the inconveniences that come with wires, this is a future I am actually looking forward to. The latest to embrace wireless technology is the mobile charging sector. And you cannot imagine just how the wireless charging system has proven to be useful. This is one manufacturer that is not satisfied with just giving you a wireless charger they want to give you a beautiful wireless charger and with the additional capability of fast charging. This charger is able to intelligently identify the phone being charged so that it automatically switches to fast charging mode for the compatible devices and uses the 5W standard charging mode for all of the other devices. Smartphones that utilize the 10W fast charging mode of this charger are the models of the Galaxy S series starting from Galaxy S6 edge+. 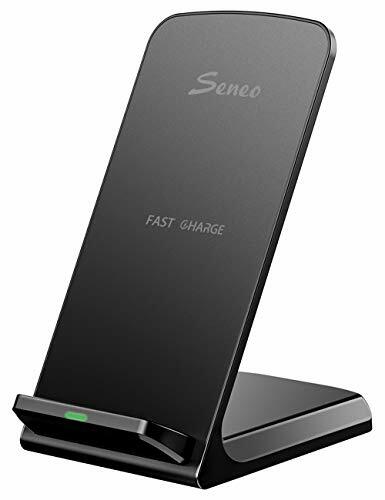 Although all iPhone phones can only use the 5W wireless charging, the Seneo’s 5W charging has been proven to be more efficient and stable than the 7.5W charging found in most of the other chargers. In terms of structure, the acute angle design adapted for this charging stand holds the phone in an almost upright position which is really convenient if you are always using your phone. The anti-slip rubber base ensures that the stand remains stable to prevent the phone from slipping off. This wireless charger also comes with various protection mechanisms such as Automatic temperature balance, input voltage protection and input current protection that protects your device while charging. Equipped with two highly purified copper wires this device should be able to detect and charge your phone even with a protective case on. A word of caution though, ensure that the case does not have any metal or magnetic materials as this may damage your phone. The name might lead you to believe that this device is only compatible with the Samsung devices but this could not be further from the truth. 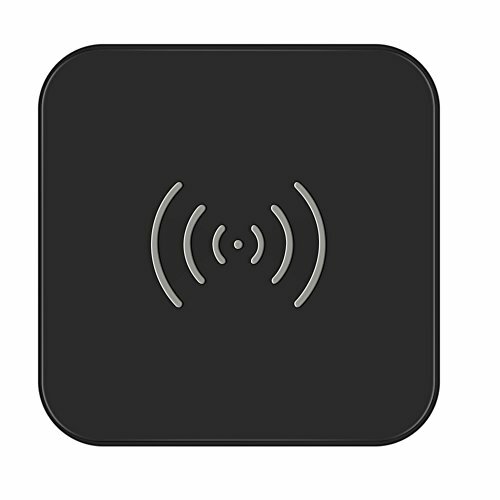 This black saucer-shaped wireless charger can be used to charge all Qi compatible devices including Apple iPhone 8, iPhone 8 Plus and iPhone X. The incompatible devices can also be charged wirelessly as long as long as you equip them with a wireless charging receiver case. The good thing about this charging pad is that it allows you to use the phone while still charging which means you can receive calls in hands-free mode or check something on the internet. The Samsung wireless charger features an LED ring to notify you of the charging status. A solid blue light indicates that your device is charging while green means that charging is complete. The charger automatically stops charging when the battery is full to prevent overcharging. In case you notice a blinking blue light then it’s an indication of a charging error. Try repositioning your phone on the pad or restarting it. Included in the package are a wall charger and a cable. More than you will find in some of the other chargers that require you to buy your own wall adapter. 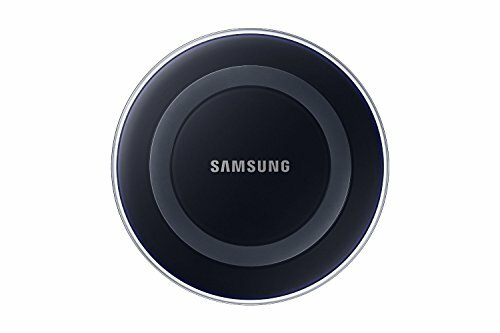 It should also be known that this version of the Samsung wireless charger does not support fast charging. Therefore, if that is an issue for you, you can opt for its newer model. This wireless charger will particularly appeal to Samsung users since it gives them the opportunity to match their smartphones with a similar brand of wireless charger. Choetech has been into wireless charging for a few years now during which they have drawn quite a huge following mainly because of their high-value products and great customer care service. If you have a protective casing on your phone then removing it will not be necessary as this wireless charger will still be able to charge your phone as long as the case is not more than 0.16 inches long. However, for the best charging experience, it is recommended you remove the case. After extensive data analysis, Choetech was able to develop just the right size for you by compressing all the features into a 0.3-inch thick device that can be carried around easily but is still big enough to comfortably accommodate your device while charging. This wireless charging pad is also equipped with an integrated smart chip that protects it against overheating, overvoltage and short circuits. As a sign of good faith, Choetech gives you an 18-month warranty. This charger is available in multiple colors and you can hence pick one that blends well with your other accessories. If you are operating at a tight budget then the Choetech charging pad is your best bet. You will have to compromise on the fast charging option but you get to enjoy all of the other advantages of using a wireless charger. In addition to the convenience of charging your phone wirelessly, we can all agree that the next best thing about the wireless chargers is the fast charging feature. Which is why it’s always great when a wireless charger has this feature. 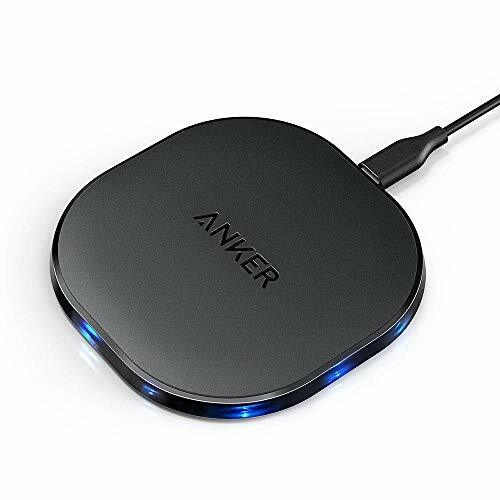 Take the Anker wireless charging pad for example. It has the ability to charge any compatible device about two times the normal charging speed. Also, apart from the usual galaxy note 5 and the newer Galaxy S series, latest iPhone users also get a taste of the fast charging mode with the 7.5W wireless charging while all of the other Qi compatible devices get the standard 5W wireless charging. Another highlight feature of the Anker charging pad is the laid back LED indicator light that goes off after charging is complete. Anybody that has had to cover the charging pad to block off the light at night will really appreciate this wireless charger. And by the way, we do not recommend covering the wireless charging pads as that just messes with air circulation. If you thought the Anker charging pad is sleep-friendly then wait till you hear about this. Immediately after plugging the Yootech charger to your power outlet, the green LED will flash briefly for 3 seconds. The light will then turn on again for about 16 seconds after you have placed the device to be charged after which it goes off for the entire charging process. What this means is that you don’t have to worry about the indicator light disturbing you at night. In case there is a charging problem, the LED will blink continuously. This is usually as a result of metal or magnetic materials interfering with the flow of current. Other great features include fast charging capabilities and Temperature Control Technology to ensure the charger remains cool for efficient charging. 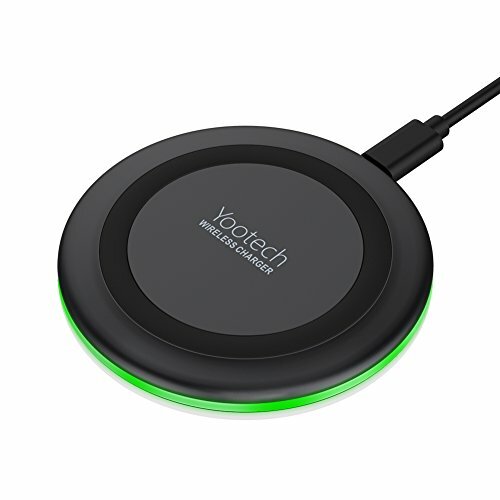 To close it off, you will have an 18-month money back guarantee or the option to replace your Yootech wireless charging pad.